Contact – Volunteer – Donate! Today I filed for the vacant legislator seat in District 6 to serve Wolfeboro. Throughout my many years in Wolfeboro, I have worked through several non-profit organizations to serve the needs of our community. I have never before sought political office. However, the current direction of our state and federal governments has convinced me that we must stand up to protect what is sacred about our democracy and values! I am hoping I can count on your support and willingness to help out. There has never been a Democrat from Wolfeboro elected at the state level. Because of my years of non-partisan work for the Community, there is hope we may have an opportunity to break that ceiling. There are many ways you can make a difference. Help address post cards and letters/flyers that will be going out. Put out a sign (if you live on a designated main thoroughfare – there will only be 50 printed). Talk to people about the importance of the election and share information about my candidacy. Send a donation to help fund the campaign. 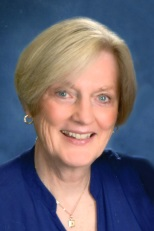 Wolfeboro Democrats, PO Box 338, Wolfeboro NH 03894. 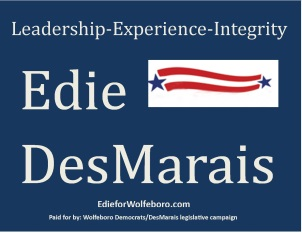 The check can be written to: Wolfeboro Democrats and notated “DesMarais Campaign”. If you are willing to help, please send me an e-mail, desmarpe@metrocast.net, with your contact information and how you would like to participate. Please come to the Wolfeboro Dems meeting Tuesday, 2/28 at the Wolfeboro Inn at 7pm and share your thoughts and ideas! It will take ALL of us to make this happen! Support Edie’s campaign with ActBlue!